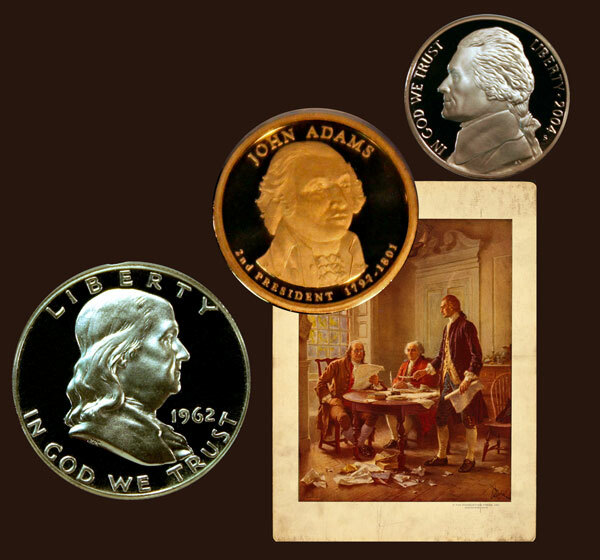 Today, the Franklin Silver Half Dollar, John Adams Presidential One Dollar Coin and Jefferson Five Cent Coins remember when the first Resolution for Independence moved from Committee to the full Congress 240 years ago. On June 28, 1776, the committee, having agreed upon the language in the document, presented the Resolution for Independence to the Continental Congress in Philadelphia. In his autobiography, John Adams, who was one of the committee members, described Thomas Jefferson as the choice to write the document. In the beginning of May, I procured the appointment of a committee, to prepare a resolution recommending to the people of the States to institute governments. The committee, of whom I was one, requested me to draught a resolve, which I did, and by their direction reported it. Opposition was made to it, and Mr. Duane called it a machine to fabricate independence, but on the 15th of May, 1776, it passed. It was indeed, on all hands, considered by men of understanding as equivalent to a declaration of independence, though a formal declaration of it was still opposed by Mr. Dickinson and his party. Not long after this, the three greatest measures of all were carried. Three committees were appointed, one for preparing a declaration of independence, another for reporting a plan of a treaty to be proposed to France, and a third to digest a system of articles of confederation to be proposed to the States. I was appointed on the committee of independence, and on that for preparing the form of a treaty with France. On the committee of confederation Mr. Samuel Adams was appointed. The committee of independence were Thomas Jefferson, John Adams, Benjamin Franklin, Roger Sherman, and Robert R. Livingston. Mr. Jefferson had been now about a year a member of Congress, but had attended his duty in the house a very small part of the time, and, when there, had never spoken in public. During the whole time I sat with him in Congress, I never heard him utter three sentences together. It will naturally be inquired how it happened that he was appointed on a committee of such importance. There were more reasons than one. Mr. Jefferson had the reputation of a masterly pen; he had been chosen a delegate in Virginia, in consequence of a very handsome public paper which he had written for the House of Burgesses, which had given him the character of a fine writer. Another reason was, that Mr. Richard Henry Lee was not beloved by the most of his colleagues from Virginia, and Mr. Jefferson was set up to rival and supplant him. This could be done only by the pen, for Mr. Jefferson could stand no competition with him or anyone else in elocution and public debate. Here I will interrupt the narration for a moment to observe, that, from all I have read of the history of Greece and Rome, England and France, and all I have observed at home and abroad, eloquence in public assemblies is not the surest road to fame or preferment, at least, unless it be used with caution, very rarely, and with great reserve. The examples of Washington, Franklin, and Jefferson, are enough to show that silence and reserve in public, are more efficacious than argumentation or oratory. A public speaker who inserts himself, or is urged by others, into the conduct of affairs, by daily exertions to justify his measures, and answer the objections of opponents, makes himself too familiar with the public, and unavoidably makes himself enemies. Few persons can bear to be outdone in reasoning or declamation or wit or sarcasm or repartee or satire, and all these things are very apt to grow out of public debate. In this way, in a course of years, a nation becomes full of a man’s enemies, or at least, of such as have been galled in some controversy, and take a secret pleasure in assisting to humble and mortify him. So much for this digression. We will now return to our memoirs. The committee had several meetings, in which were proposed the articles of which the declaration was to consist, and minutes made of them. The committee then appointed Mr. Jefferson and me to draw them up in form, and clothe them in a proper dress. The sub-committee met, and considered the minutes, making such observations on them as then occurred, when Mr. Jefferson desired me to take them to my lodgings, and make the draught. This I declined, and gave several reasons for declining. That he was a Virginian, and I a Massachusettsian. 2. That he was a southern man, and I a northern one. 3. That I had been so obnoxious for my early and constant zeal in promoting the measure, that any draught of mine would undergo a more severe scrutiny and criticism in Congress, than one of his composition. 4. and lastly, and that would be reason enough if there were no other, I had a great opinion of the elegance of his pen, and none at all of my own. I therefore insisted that no hesitation should be made on his part. He accordingly took the minutes, and in a day or two produced to me his draught. Whether I made or suggested any correction, I remember not. The report was made to the committee of five, by them examined, but whether altered or corrected in anything, I cannot recollect. But, in substance at least, it was reported to Congress, where, after a severe criticism, and striking out several of the most oratorical paragraphs, it was adopted on the fourth of July, 1776, and published to the world. The Franklin Silver Half Dollar, John Adams Presidential One Dollar Coin and Jefferson Five Cent Coin show with an artist’s image of the men working on the Declaration of Independence.